September 8, 2015 (SSB) — A good score of the self-claimed vigilant top leaders, under President Salva Kiir, betrayed South Sudan to foreign nations; embezzled nationals resources; owned mansions, fat accounts in alien nation, hooked up with a colorful professional daughters of superior UN countries, late Emmy Riek not worth mentioned, for political gain, but disregard improving basic public institutions in the country including: educations, health centers, infrastructures, and security to advantage of the most disadvantaged civil populations, to whom they deem to exploit their destitute situation to fight their wars of interests; on occasion when politicians defect of being asked to give a chance to more other SPLM political members for self-rewarding purpose. Under presidency, collectively, most politicians seem impervious to the failing of services delivery in the nation, a virgin nation we promised to have the needs of the needy, by falling short to pay dividends to families of countless wars’ victims, but in self-defense only stick or aim to continuously citing hindering or scapegoats due to dishonesty within the leadership; series of backwardness caused by Sudan Government before South Sudan independence, George Athor before killed, David Yau Yau before reconciled and achieved autonomy of Greater Pibor from Jonglei State and now Riek Machar damaged of Bentiu oil refinery, in a hot pursuit of Presidency, yet these the same politicians keep throwing up their privately owned towers or buildings here in the country or elsewhere in the world. Meanwhile, more other Political figures engaged with survival styles of looting nation’s wealth including Constituency Development Funds(CDF) and border taxes to marry many wives or to buy brand new cars, and to build themselves lodges, hotels, residential places; similarly others in a nepotistic chain of privileged custody facilitating projects of let-me- get-rich-quick; pursuing hard currency letter of credits with the country’s central banks, Commercial Banks and forex to sell in a black markets- deflate South Sudanese Pounds farther under a U.S dollar, for underprivileged not to be able to buy anything of value anymore, but struggle to long for humanitarian assistance in hand of UN in the country. As a history reminds us, commenced far back from 1956, May 16, 1983 liberation struggles, through CPA to Independence, not realized, the success of those Movements attributed to diverse contributions of the now ignored illiterate communities of South Sudan: donated their most sacrificed lambs to die; to be wounded; to be widows, widowers and orphans, and also food items and services in support of the movements; however, lack of rewards to these communities contributed to continuous national conflicts including tribal violence; this is a cause of crisis and a room for foreign intrusions. Presidential Inner-circle financial misconducts: fire proof-safes scandal by the Former Minister of Cabinet Affairs, Deng Alor and Kosti Manibe, the former finance Minister that were discharged from the national executive council with no accountability punishment sudantribune.com/spip.php?article47010 imposed on them to serve sentences in a Jail, but instead left to morph to G10, is another window of opportunity and motivating factor for more criminals including UN forces. Moreover, in presence of the so-called Anti-corruption commission, seeing no legal action had ever been taken against the formers, Presidential Chief of Staff Mayen Wol Jong and office assistance, Yel Lual Koor in connection with others reiterated Alor and Manibe’s foot-prints of corruptions by counterfeiting President’s signature to receive millions of Dollars in checks from current Min. Deng Athorbei, Finance and, Gov. Koriom Mayiik, SS. Central Bank south-sudan-corruption-president-kiir-aides-suspended-/2844966.html, yet not conspicuously punished by the law. Faced with a conditioned, dependent syndrome disorder, a mundane and coordinated scandal in the leadership, in addition to previously signed UN chapter seven charter-provisional measures of a failed state that stealthily allowed UN forces to occupy sensitive cities of the country including airports, when ample, capable SPLA divisions and organized forces present to secure civil populations or public properties in the country; this is already an authorized gateway entry for UN forces, Troika to invade South Sudan. Furthermore, under the presidency, Presidential guards uncontrollable internal bickering of guards murdering guards over decent positions or intimate recognitions, although, with his resilient personality, President Salva Kiir deserved magnificent credit for successfully achieved us independence of South Sudan; on the other hand, these messy behaviors perceived and epitomized incapability for the shepherds or shepherd to make candid team leaders or leader to the satisfaction of the most. In the broken window theory, “untidy house is more likely invaded by criminals, poisonous snakes, insects including scorpions”. Now executive failure’s to clean up its house of magnitude of dirt, it also permits harmful foreign nations to return back South Sudan to colonization era, unless constitution must be respected. Appeasement policy to get repealed. Tiger must show its claws in action, not in a timid tone, by taking a lead, not Troika, UN forces or UN agencies. Evidently experienced with prominent capacity building activities by Troika, UN-forces and UN agencies: training of security forces, Protection of detained in UN Camps, bored, repeated three days Peace workshops, and Consultative meetings, human right violation investigations to produce noncertified professional work-shoppers plus attendance rewards to sleep in expensive hotels: Accommodations, tea, water, are not long lasting substantiation of allegiance to give away our country to them, to be under their protectorate. Although Peace in South Sudan is badly needed to substitute and compensate the neglected communities of long failed services delivery by the leadership and all other politicians, President’s internationally coerced signed IGAD plus compromise peace document has no viability to bring a durable peace, but a short term relief-by a non-swimmer dodging engulfing fire to a river later get drowned, and much to our chagrin, the country’s head-master and discipleships are who to blame for any invasion. Presidency must erase its appeasement policy, supervise its politicians, provide necessary services to the vulnerable communities, be abided by the supreme laws of the country, punish the corrupted ones and then wait to witness how South Sudan will be taken over again. Yes,brothers and sisters.No one be a best President like Kiir Maryardit among his generation including rebellions or G10 groups in the South Sudan leadership.So let us honest and judge ourselvs on our affairs.yes,corruption is strong key which brought us all this massive and we cannot blame government on its because those who were in system of government to playing all this were us not president.so let as play peace and rule of law among us that were we will achieve our country image and dignitaries of us and Thanks. Yes Manyang Duaany Jok, you have mentioned all. 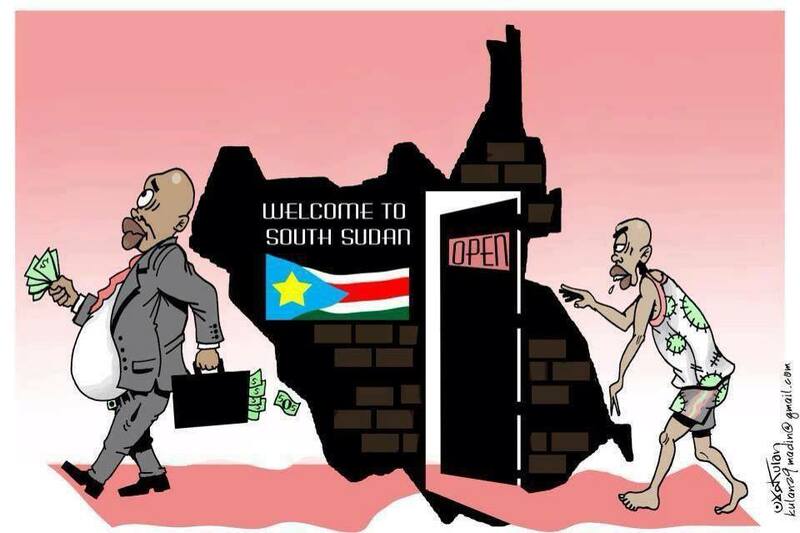 Corruption is really a disease that have affected our brains and have occupied nerves of our leaders who have turn their back to the poor and needy people of South Sudan, instead to feed them, they kills them and instead of development they destroys. Look out Isaac Majok it is not all of us who are corrupt. As clarified by the author of this article, it is the leadership who is corrupt. 1. where are our CDF? 2.Where are donations from US, EU, UN and other world organization? Now they have destroy the oil facilities in Bentiu for this senseless war of greed and corruption. Now they are selling our Young country to the foreign nation for greed of power. Do they really know how the struggle of this nation cause us?